Bills from NTT are the largest (physically, as in size of the document and envelope) piece of monthly utility-related mail I get at home. It seems like a pretty big waste of paper for a billing amount that never changes month-to-month and which I can already and more easily double check by flipping open my bank book. So the other day I signed up for NTT e-statements. It's a pretty easy procedure, and it knocks a simple 100 yen off of your monthly bill. Since you're probably roped into a 2-year contract with them anyway, in the long run that's about $30 saved. To do this, you can still contact a representative at NTT East's @Billing service or NTT West's MyBilling service, but since all the financial transactions of both are handled through NTT Finance now, that's ultimately where you'll end up. 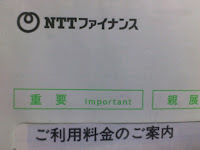 So on NTT Finance's site, hit the apply (お申し込み) button and fill in your account information. A word before beginning the application: You have to be paying by automatic bank withdrawal (口座振替) or credit card to be able to switch to e-statements. If you pay for your NTT service in cash by taking the bill to a convenience store, you'll have to switch to another payment method first. After you fill this info out, NTT Finance will contact you by telephone to confirm your request. The postcard detailing your login info and change to e-statements will come by mail a week or two later.